Summary: Very few fells have such a distinctive shape as that of Yewbarrow, from the south-west it is a definite peak but from either the east or west side it shows it’s one mile long ridge shape. This fell was listed by Waiwnright for inclusion on all of his lists. 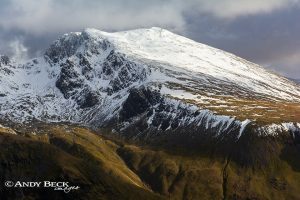 Whilst the summit ridge above 1800′ is relatively flat and easy going either end of the ridge are steep and rough crags, Bell Rib at the southern end and Stirrup Crag at the northen end. These crags can be a deterrent to the casual walker. The ascent from the south is normally made by following a rough path up between Dropping Crag and Bell Rib which requires an amount of “hand’s on” work in places. At the other end Stirrup Crag is a bit more of a challenge with sections of easy scrambling which may be off putting to those not used to rock work. However, there is an easier option of ascent avoiding both crags, a grassy path can be taken from near the top of Over Beck close to Dore Head which gradually rises up to the summit on the western side of the fell. 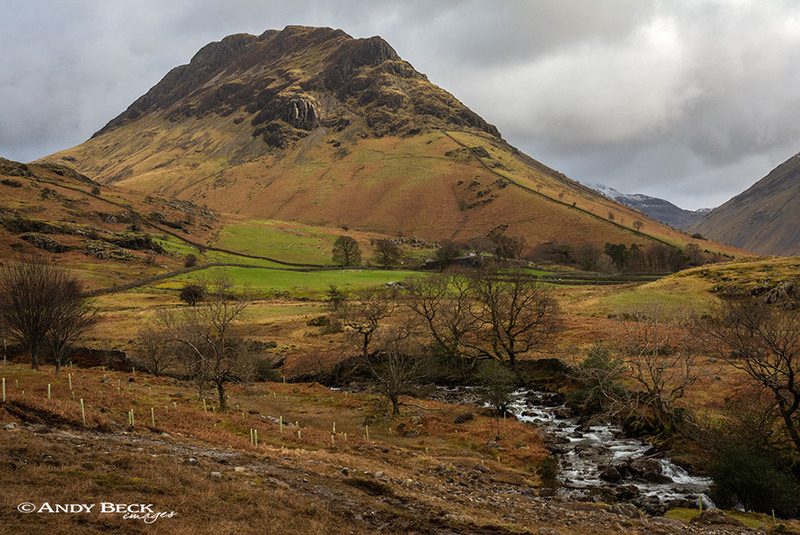 Normally the fell is ascended from Wasdale, either by parking at Overbeck or Wasdale Head. Topographical details: The height of 2058′ given by Wainwright was taken from the 1 inch O.S. map of the day. Today the measured height of the summit is 2057′ 627m GR: NY17337 08473. The Wainwright summit is marked by a decent sized rough cairn placed by an angular block of rock (shown below). There is a trigonometrical point on the summit in the form of a ground bolt which is most likely to be under the cairn. There is at least one more cairn further north near the top of Stirrup Crag. 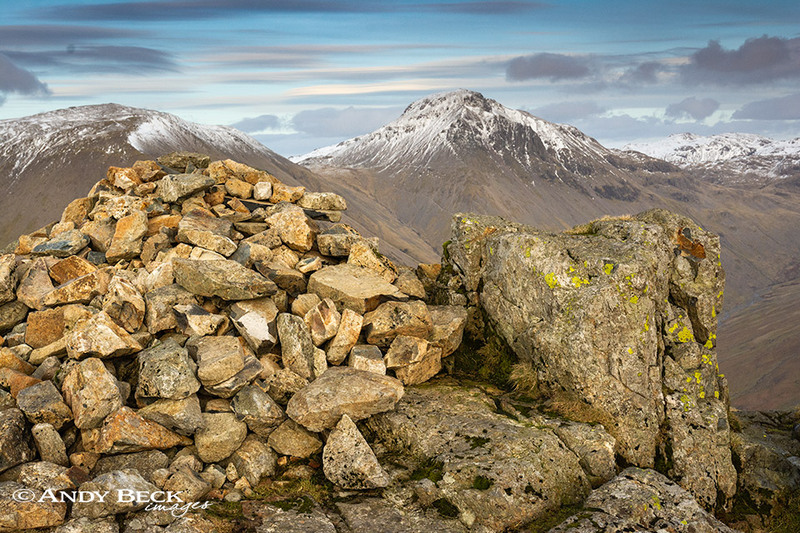 Points of Interest: Impressive views of the area of Wasdale Head and the majestic Scafell massif and Great Gable can be seen from the summit, best views can be had by deviating from the main path on the summit to the east. Worth a look is the huge gash on the southern end of the fell known as Great Door. There are in fact two such features and many walkers mistake the lesser gap as the named one as the path now by-passes the more impressive and almost vertical walled Great Door, the lower and more southerly gap. Dore Head down to Mosedale has perhaps one of the most famous scree runs in the district but it has become very eroded and awkward for descent. Waterfalls: Over Beck has one or two small falls. Adjoining fells: Red Pike to the north can be reached via Dore Head. 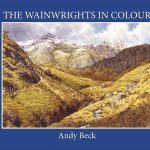 Nearest Facilities: Car parking at Overbeck (free) or Wasdale Head (free). Camping at Wasdale Head. Pub at Wasdale Head Inn, small shop The Barn Door. Star rating: (3.7 / 5) Yewbarrow is a fell worthy of a visit on its own or even better as part of the Mosedale round. It lacks in points of historic interest but the crags at either end present an entertaining challenge. The views of the Wasdale giants are impressive.